The Universal, meaning that something that is common among many (possessed by many), plays an important role in Philosophy, and as such dates back to SOCRATES. Especially in Metaphysics one disputes its reality status (its status of being). So one asks : Does a universal exist in reality, or is it just a common name signifying a collection of similar (looking) things? In order to answer such questions it will be useful to consider two Domains of being, the Real World (the world of real beings) and the Ideal World (the world of ideal beings). This distinction is proposed by the philosopher Nicolai HARTMANN, in his works on Ontology (1930's, 1940's), the science of Being. (These works are however not directly concerned with beings, but with Being as such, and its general attributes.). The Real World, the domain of real beings, is the material world. It is in this World only that processes can take place, and they do indeed take place all the time : The Real World is thoroughly dynamic. It is the world we live in, including all the acts of thinking, which are the result of material processes taking place in material structures, brains. All the things in this Real World are OBJECTIVE, which means that they exist, and are what they are, irrespective of being thought about or being observed. Some say that quantum mechanical entities, like electrons, are an exception, but according to me they are objective too (because we can investigate their properties), although they seem to be deficient beings, beings that are not completely determined (Even the assertion of their non-objectivity is, by the way, objectively meant). 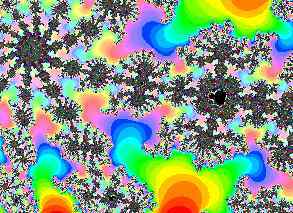 But besides the things of the Real World, the material things, we also have 'things' like mathematical structures, for instance the Mandelbrot fractal, which is a geometrical pattern (See the figures, each showing a fragment of this 'Mandelbrot-landscape') and they are clearly immaterial, but nevertheless OBJECTIVE, because they turn out to be what they are, and can be investigated in order to assess their properties. I have myself investigated the above mentioned Mandelbrot fractal, which shows a remarkable structure. It is a structure generated by an abstract dynamical system according to the logic of mathematical deduction. As soon as the formula (= the prescription) for its generation is set, the ideal (deduction) 'process' starts, and goes its way beyond our control. So it is what it is, and was what it was, independent of mathematicians being there. It turns out to possess an intimate delicate and complex structure in which several regularities can be discovered. In a way we can observe and experiment with it. In fact the Mandelbrot fractal is a four-dimensional object of which we can investigate several slices in order to obtain an insight into its complete structure. It turns out to be infinitely detailed. This objectivity applies to every mathematical object whatsoever. The same goes for logical relations, which of course are closely connected to mathematical ones. So we have found a domain of immaterial structures that are nevertheless objective in (their) nature, and this fact necessitates the postulation of a 'Second World' : The Domain of ideal, (and thus) immaterial beings, the Ideal World (or Ideal Sphere of Being), consisting of these static immaterial patterns, which are connected by (or maybe consist of) logical relations. The Laws of Nature, and also the special dynamical laws (governing particular dynamical systems, like chemical reaction systems) are, in their ABSTRACT (and thus mathematical) form, inhabitants of that Ideal World. The relation of the Real World with the Ideal World could perhaps be viewed as a simulation process. This asks of course for more investigation, which we however will not carry out in this dissertation. How do we make contact with this Ideal World, how can we get knowledge of those immaterial structures? In a preliminary fashion we could say : We can make contact with that World by recreating the relevant structures (the structures of that world), and we perform this by doing mathematics and logic. Remark : On several occasions in this website I have objected against the existence of an immaterial soul in animals and especially in humans. How does this square with my postulation of a world consisting of immaterial beings? Well, an immaterial soul is (by its proponents) said to exist in the Real World, because it is supposed to exist in, say, a human being, while the immaterial structures we spoke about above are not existing as such in the Real World, but in a totally different World, the Ideal World. In the Real World immaterial things are just the result of abstraction (by us), they do not exist as such : The Real World is ontologically homogeneous (not heterogeneous). Also the Ideal World is ontologically homogeneous. The Universal is generally known to be the common element in similar things, and signified by terms such as 'HOUSE' (in this case relating to some aggregates), or, say, 'DOG' (in this case relating to some uniform beings). Such a universal we find by leaving out properties which are only connected with the individual. The left-over will be the common properties. A universal thus conceived is the result of abstraction done by our intellect (the process of leaving out the properties connected only with the individual). So in a way the universal is created by our intellect by an act of abstraction. One is tempted to state that by this process we discover the Essence of the thing. And so one says (for example) "Socrates is essentially a human", belonging to the species Homo sapiens (If we do not discriminate between the different hypothetical species of man, or do not consider their differences essential, then we can say that they all belong to the species Homo ). But we found out that the Essence (Identity, Whatness) of a uniform being, is the dynamical law of the dynamical system that generated that being. And this dynamical law is not created by us by means of abstraction. So the Universal is not the Essence (of a thing). But what is it? The preliminary observations just given are sufficient to give the question some meaning. Now we can try to answer it. An Identity ID at space location C.
The three beings (uniform beings), represented by this Identity ID -- let us call them A, B and C -- do differ to be sure concerning content (because of their different positions and a different interweaving in the overall collocation of the Real World), but these differences (concerning content) are in this case (ex hypothesi) accidental because the Identities do not differ concerning content, all three of them are ID. Moreover these differences can be so small that they escape observation. Each for themselves the beings A, B and C remain singular beings (we could also say : particular beings), and they are also each for themselves individuals. Their being singular opposes their being universal. The three mentioned identities ID (at the location A , at the location B and at the location C ) are not general (universal), because they are three, and are separated from each other (the Identity is 'copied' in three real beings). But also as Identity ID, or in other words : also (considered) only insofar as it is the content of Identity ID, it is true that Identity ID is not a universal, because, although now it is numerically one, it does not exist as such in the Real World, but (as being numerically one) as an abstraction, i.e. not as ID itself but as a mental sign. In its formal form, thus as Identity, ID exists as ONE identity in the Ideal World (the domain of ideal, immaterial beings), and in its concrete appearance it exists as an individual material uniform thing (i.e. a true being, a Totality) in the Real World (the domain of real, material beings), or multiplied (copied) in more than one such uniform things (beings). Taken as such, i.e. as a formal relation (a mathematical structure which is equivalent to the particular dynamical law) the Identity cannot exist in the Real World. But if we consider the uniform [NOTE 1] things (Totalities) 'themselves', thus the things in their appearance as things [NOTE 2], or, stated more precisely, when we consider the 'phenotypical expressions' of their identities, and place them in certain classes on the basis of phenotypical similarity [NOTE 3], then we obtain terms which, each for themselves, refer to a collection of uniform things which are similar, terms which are the result of a 'phenomenological' classification. This can also be applied to properties (and to the things having those properties, from the viewpoint of those properties). The following example will clarify this. The collection of all the individual soldiers living now, but also who has lived in the past and who will live in the future, is a class, a type. We place them in the class SOLDIER (remember the universal soldier of Donovan!) because of certain similar properties. By establishing the Universal (in this case), we don't use the term ARMY, because an army is, with respect to being a soldier, only an accidental collection (of soldiers), established by political and national discriminations and decision-making. But of course the collection of all armies is a class and is signified by the (universal) term ARMY. A term signifying a class (a collection, but not an accidental collection) implies a 'one-over-many' (one term, signifying many items). (a) The term signifies some one content, and as such it could perhaps signify a universal (residing somewhere in the extra- or intramental world). (b) The term ultimately signifies a collection of discrete and concrete things. In the examples to follow, for convenience only two or three significata are mentioned in the case where the reference is, not to a universal as such, but to discrete concrete things. These two or three significata are however not the only members of the collection of things to which the reference is made. The reference is of course made to the whole relevant collection, which should not be an accidental collection, but a whole class that is a class in virtue of intrinsic reasons. If such a term (on the basis of similarity, it is true) refers to, phenomenologically, after all different uniform beings (limiting ourselves to these), say to crystals of different materials, and moreover having different intrinsic shapes, for example a Sulphur crystal and a common salt crystal, then that which is signified by such a term (the significatum ) cannot be ONE item, i.e. the ONE term does not refer to ONE item (The significatum is not ONE in number). This means that the term does not refer to something (i.e. to some-one-thing). And this is equivalent to the assessment that such a 'universal' to which that one term would refer, does not exist independently of our thinking. In this case only the term is universal. This term could read : CRYSTAL. In a classical context such is for example the term HUMAN. This term, as a sign, refers either to Socrates, or to Plato, or... etc. But (considering a case ) if the uniform things (a multitude thus), referred to by ONE term, would be phenomenologically identical, i.e. looking exactly the same, then it is still the case that ONE term refers to several (i.e. more than one) items, for instance a NaCl (= Sodium Chloride, common salt) crystal and a KCl (= Potassium Chloride) crystal. Both can be colorless, and both can have a cubic form (yet they are essentially different, having different identities, because their chemical composition differs). The term then refers (in this case) either to the NaCl crystal, or to the KCl crystal. Also in this case a real existence of a universal (an existence independent of our thinking) is out of the question, because, again, the term does not refer to some-one-thing (i.e. to something). In this case the universal could be signified by the term CUBICALLY SHAPED CHLORIDE CRYSTAL, but as such it is dependent on, and residing in, the intellect, while as a sign referring to many concrete things. But if ONE term T refers to several uniform things, A, B and C, all having however precisely the same Identity -- let us call it ID -- , thus governed by precisely the same dynamical law, then T still refers to the Real World, and thus the ONE term T still refers to more than one item, namely A, B and C, and thus the term T, signifying a universal-in-the-Real-World is still out of the question (i.e. whatever T signifies, it does not signify such a universal). A, B and C could for example be : three crystals of the same sort (the same crystal species), say, three crystal individuals of NaCl (common salt) not necessarily looking the same. The term COMMON SALT CRYSTAL(S) then refers either to this crystal (pointed to with the finger), or to the other one, or to ... etc. The term COMMON SALT CRYSTAL(S) usually refers to all existing, having existed and in the future existing, common salt crystals, but this also is a collection of beings (things, in this case crystals), and thus a multitude of beings. But if in this last case (case 3) one refers to the Ideal World, and this we can do with the term ID (and implicitly also with the term T [NOTE 4]), then the ONE term does indeed refer to ONE item, namely the (relevant) dynamical law taken formally (as a mathematical structure, residing as such in the Ideal World. In this World all logically consistent mathematical and logical relations and metarelations [NOTE 5] do exist by themselves). In the Ideal World the Identity ID cannot occur as a numerical multitude, because in this domain copying is impossible. The reason for this is that the copying process requires a material context (the copies must be held spatially separated). The above described case of an Identity ID being present at location A, as well as at location B and also at location C, concerning the uniform things A, B and C, was concerned with the Real World. In that World it is possible that copies are being formed of ID. So in the Ideal World, universals, it seems, do occur. But the phenomenon of being universal implies being-one and being-many at the same time, both in ontological (= according to nature, according to being) respect : something, namely that which is universal, exists as something that is numerically one in that which is numerically a many. In the last mentioned case (3) of having ONE term T referring to more than one uniform thing, namely to A, B and C, all with the same Identity, that something, which is numerically one, is present in the Ideal World to be sure, but the (with that numerically one) corresponding numerically many, the uniform things A, B and C, is not present in the Ideal World. And thus the one and the many are separated, inhabiting fundamentally different Worlds. So this case does not satisfy (the condition of) the numerically one seated in the numerically many, and thus the term does not refer to a something that is universal, or, in other words the term does not signify a universal, a universal with respect to those uniform things A, B and C, and as such residing in the Ideal World. In the Real World the ONE is absent, and because of that a presence of (something) being universal in that World is out of the question too, and consequently the presence of a universal. In the domain of uninterpreted mathematical relations -- i.e. relations which are not interpreted in terms of the physical world, or in other words, relational (mathematical) terms devoid of any physical meaning -- which (domain) is in some way seated in the Ideal World, we do nevertheless encounter (and are concerned with) the general and the less general (both present in the Ideal World). There it is possible that something, for instance a mathematical relation, is universal with respect to other, less general relations present in that World. In this way, to give a very simple example, the one aX is seated in the many 1X, 2X, 3X, 4X, etc. But with respect to real beings we do not find universals in the Ideal World, because those real beings are not present in that world. But where then do we find the universals, universals with respect to real beings? They are, as we saw, in their function of being-universal, not present in the Ideal World, because there the 'many-part' is absent. If they are somewhere, then they must be present somewhere in the Real World. But they are, as we saw, also not present in that subdomain within the Real World that is extramental (outside our thoughts), because the 'one-part' is absent there. It follows that they must be seated in the intellect , which itself belongs to the Real World. This implies that a universal with respect to real beings is an epistemological item (and so not an ontological item) and as such belongs to our way of knowing. The universals-in-their-function-of-being-universal-with-respect-to-real-beings thus belong to the cognitive functions, in this case the cognitive functions with respect to the possibility of knowing real beings. The Ideal World cannot be equated with the (human) intellect, because the Ideal World is objective, it does not create its inhabitants, these inhabitants are the way they are. Only by successfully recreating the Ideal relations, the intellect has access to this Ideal World. As such the universal, with respect to real beings, exclusively exists in the mind, and is in that form a (ONE) sign -- a natural sign, that can be expressed, by speech or in writing, by a conventional sign -- signifying many items. The sign (in the context of a one-over-many, i.e. in its function of signification) is always universal, and in the mind, while that which is signified by it either also is in the mind, or outside the mind. The mental sign is a human-bound (or, more general, knower-bound) item, but nonetheless a symbolic representation of a multitude (or potential multitude) of mental or extramental items (including states). The biological -- because a human is an organism -- symbolism (mental signs, natural signs) is being transformed in an arbitrary symbolism (conventional signs) in the relevant language of speech and writing. The mental sign (and also the conventional sign) is in itself (i.e. not in its significative function) : a neural activation pattern (and when it is a conventional sign : moreover a resulting soundpattern or a graphic pattern). The meaning of a symbol, thus that for which it stands, is extrinsic to the symbol itself. Meaning is generated by a historical and also by a here-and-now context. So the sign, as one-over-many (thus in its function of one-over-many) is a universal, and this (universal) is only in the mind. This "only in the mind", expressing the ontological status of the Universal, is equivalent to the just mentioned fact that the meaning of the sign is extrinsic to the sign. The sign is ONE, but that which is signified (the significatum) is, at least potentially, a multitude. Having established the ontological status ('seat') of the Universal, we now know that the Universal with respect to real beings neither is seated in the Real (objective) World, nor seated in the Ideal (also objective) World, as universal. The Universal is an epistemological (= concerning our way of knowing things) item, not an ontological (= concerning how things are in themselves, according to nature) item. The term SINGULAR with respect to a being emphasizes its being-one-in-number on the spot. More than one space-time locations can harbour more than one singular beings. This must not be taken to litterally, because space-time is not simply a recipient for things. The term PARTICULAR with respect to a being emphasizes the contingency. The term refers to a ' once upon a time ' case, a more or less isolated case. The term INDIVIDUAL with respect to a being emphasizes its undividedness, and so its being intrinsically ONE. In most cases we can do with the term INDIVIDUAL (i.e. the term suffices in most considerations), which encloses in a way the other aspects (of particularity and of singularity). In a logical context we can talk (if desired) about the ' general individual ', namely in those cases where we do want to express the aspect of individuality, but without implying contingency. So we can talk about " the individual human " meaning either Socrates or Plato or Petrus or....etc., and not only (pointing to) Socrates. In the same way we can talk about "the general animal individual", meaning this snail, or that snail, or that wolf, or that horse, or ... . In still a more general sense we can talk about "the general individual just like that", meaning this molecule, or that crystal, or that horse, or Socrates, or ... .